The winning edge in team sports often comes down to conditioning. Many athletes prepare months ahead of time for the upcoming season. Sports such as ice hockey, basketball, volleyball and indoor soccer seem far off but are actually just around the corner and many athletes are preparing themselves for the upcoming season. A common thread amoung all these sports is that they demand tremendous speed and power from the competitors. Many athletes participate in a training program to to help them prepare for the upcoming season. Most of the time these programs are based on increasing muscle mass and increasing general aerobic conditioning. Many muscle mass building exercises tend to involve slower, isolated movements. 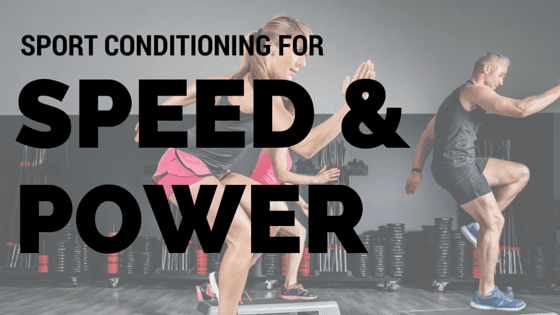 While this type of training can be beneficial to overall strength, it has been shown to hinder an athlete’s ability to generate high levels of force. In order to increase an athlete’s ability to sprint or skate maximally, or to jump higher, explosive exercises should be incorporated into training regimens. Plyometrics is one type of exercise that will help an athlete develop power and speed to optimize their sport performance. Plyometrics are exercises that allow a muscle to reach maximal strength in the shortest time possible. The goal of plyometrics is to allow an athlete to apply force very rapidly ( speed strength). They are usually introduced into a program once the strength – training segment has already begun. It is normally recommended that an athlete be able to squat 1.5 times their body weight before introducing plyos. 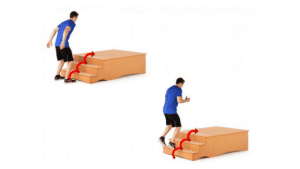 Plyometrics usually involve the athlete engaging in repetative bounding, hopping or jumping using their own body weight as the only resistance. An example of plyometric exercises would be completing half-squats and incorporating an explosive vertical jump on the “up phase” and then immediately dipping back into a half squat upon completion of the jump. Another is two foot jumping up sets of stairs ( hitting every second or third step). Plyometric exercises do not require expensive equipment. Wooden blocks and pylons are some of the only acsessories that are needed. They are excellent exercises for increasing an athlete’s ability to apply force quickly. There are safety concerns for plyometric exercises as well. It is very important to make sure a participant is properly warmed up and has the sufficient strength base to start a plyometric program. Make sure to use good shoes and a shock- absorbing surface such as a grass field. Combining strength and plyometric training are excellend ways to increase speed and power and can be used in combination. It is not advisable to combine a high volume strength workout with a high intensity plyometric program on the same day. It is best to alternate these exercises throughout the week to allow for sufficient muscle recovery. Interested in plyometrics? Come on in for a personalized program with our kinesiologist Hailey Hutzul.